Description: -Very striking clumping palm, leaf has a marbling pattern though them and looks quite special when new leaf is pinkish red. 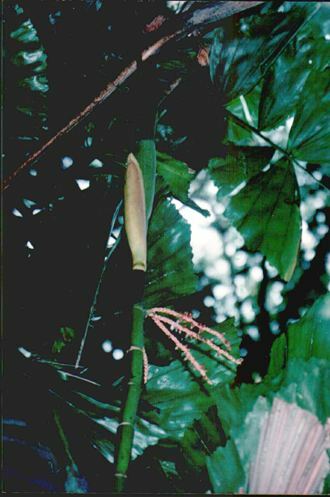 This palm will grow to around 6 or 7m tall. Flowers are white. Growing Climate: -Likes protection from cold dry winds will grow in subtropics quite well but is best suited to the tropics. Temperatures from 4.C to 35.C. Regular watering and fertilize once a year.